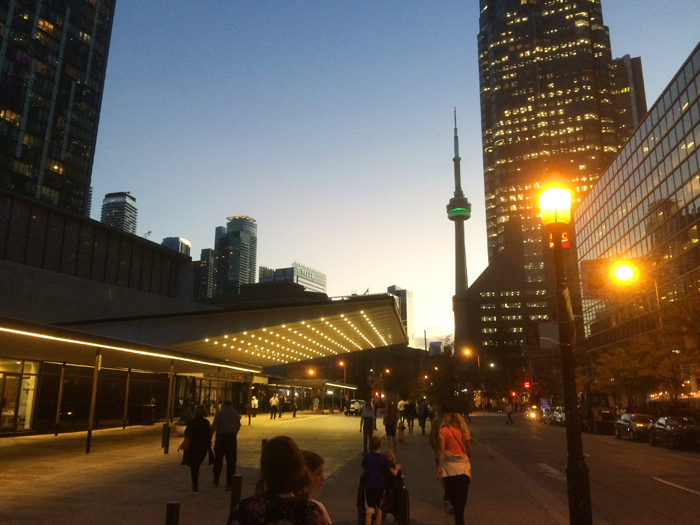 “It’s nice to be back in sunny Toronto! Especially on this last day of summer [laughter]. 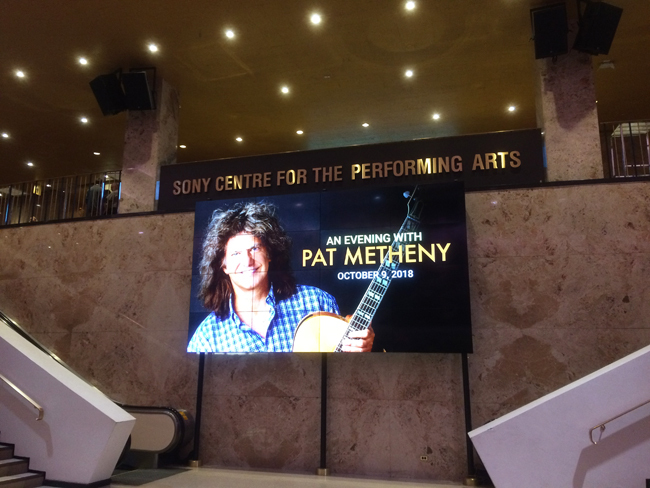 It’s always great to come up here and it has been ever since the beginning.” Near the end of what appeared to be a sold out show at the 3,200 seat Sony Centre in Toronto, Ontario, Pat Metheny greeted an audience who had just enjoyed a day of unseasonably warm autumn temperatures after a long weekend of chilly rain and clouds. The guitarist’s music, ever open and airy, went well with the change of weather, helping postpone the hunkering-down mindset many were starting to adopt for the coming Canadian winter. This was a different sort of Metheny show as, joined by Gwilym Simcock on piano, Linda May Han Oh on bass and Antonio Sanchez on drums, he played a two-and-a-half-hour set that was a jumping-around journey in time through his catalogue, all the way back to his first release as a leader, 1976’s Bright Size Life. The format was something, he told the crowd, he’d never really done before. With no new album to support, he’s been touring most of the year with this same band configuration, and what could have been a rote, “greatest hits” approach, is anything but. Rather, the musicians explored new nuances in the music, reinventing it in some cases. Songs were often stretched out, sometimes played with different guitar tones, other times with new sections or going off on different tangents and developing parts in more depth. Greeted with a thunderous standing ovation as soon as he walked on stage, before he’d even played a note, Metheny seemed to effortlessly and humbly justify that acclaim as he bent his wild nest of hair over the multi-stringed Pikasso harp guitar to begin things in an exotic fashion, with shimmering waves of melody. It was a perfect way to focus the audience, who were now so quiet you could hear the proverbial pin drop. The band entered after and, for the first hour or so, Metheny led them through tracks such as “James,” “Letter From Home,” and the sensitive and lyrical “Farmer’s Trust” with his white Gibson ES-175 (or possibly his Ibanez signature model guitar – I was a bit too far away to tell for sure.) The soaring almost horn-like sounding Roland guitar synthesizer that he pioneered and that’s become part of his trademark sound made its appearance eventually, and proved to be a favorite with the audience. I would have liked if he’d varied things a bit earlier in the show, instead of bringing the synth guitar out late and closing with a series of three duet pieces, one with each member of the band. I feel it might have made for better pacing, but regardless, those duets were a highlight of the night. “A Day in the Life of a Fool,” the duet with Linda Oh, was a new song that captured some of the feel and mood of Metheny’s 1970s years. During the duet with Simcock – a resurrected version of the Metheny chestnut “Phase Dance” – Simcock was putting so much energy into his playing that he was bouncing up and down on his piano bench. A combo of “Minuano (Six Eight)” and “Question and Answer” with Sanchez was the most experimental and adventurous sounding song of the evening, Metheny switching midway to the guitar synth and coaxing otherworldly sounds from it while Sanchez filled in textures with cymbals and bells and blocks, playing concurrent rhythms twining together and apart. An awe-inspiring thing to watch, much less to hear. Metheny came back out for the encore to play a long solo medley sitting down, including excerpts from songs originally recorded solo (“Goin’ Ahead,” “September Fifteenth”) and some adapted into that format such as “The Way Up” and “This is Not America.” When he played a section of “Last Train Home,” perhaps his most well-known composition, there was a big round of applause. The enthusiastic crowd brought the full band back out for a second encore, a faithful rendition of the bright and ringing “Song for Bilbao” originally from 1983’s Travels. Proving the old adage that “there’s one in every crowd,” a guy in a row behind me and over a bit felt the urge to yell out “Where’s Lyle? !” early in the show after a song that keyboardist Simcock had just featured prominently on. Never mind that Metheny hasn’t played with his old partner Lyle Mays in years and years and Mays is retired from music now, why would anyone think that Metheny (much less his current keyboardist Simcock) would want to hear that? The same guy also felt the urge to sing along with the melody lines of many of the songs, so taken was he by the music (I guess.) “Dude!” I wanted to say, “Sing along in your head!” Oh well, on the other hand, it’s nice that Metheny has a fervent audience and an audience that knows his music by heart. How many other jazz guitarists can say that? I’ve always wanted to see him live. Thanks for the review.